Xiaomi has announced a price cut for the Mi Max 2 in India. The phone which was launched in July, has been discounted after just 3 months. It is unclear as to what has led to the sudden price drop, and that too so quickly. We think that the device could be seeing poor sales. Here’s why. A look at Amazon India’s page for the phone, shows that the Mi Max 2 has a 4.5 star rating from 1,766 user reviews. 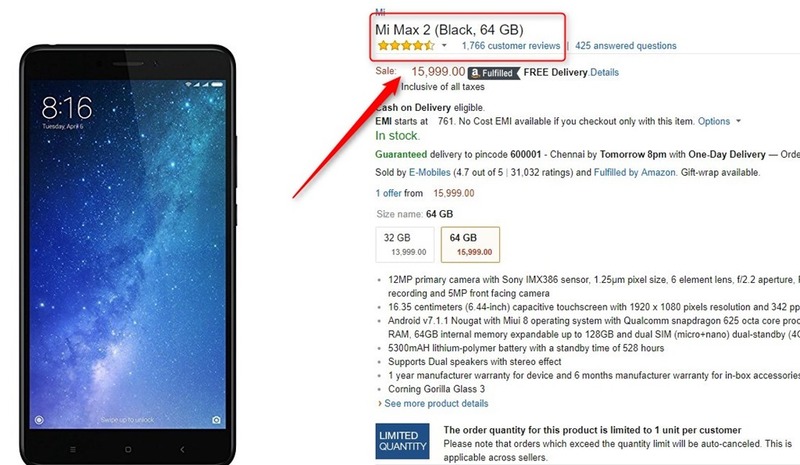 That is quite low for a Xiaomi phone. 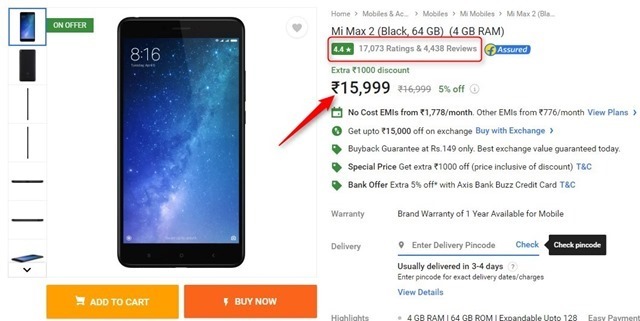 The Mi Max 2 page on Flipkart, in comparison only has 4,438 reviews and 17,072 ratings. Comparing the number of reviews for the two Phones,should give you an idea that there is a massive difference, when it comes to which is the more popular choice. Both phones have a similar spec sheet, except for the fact that the Mi Max 2 has a gigantic display and a huge battery. It is possible that people were put off by the sheer weight and size of the phone. And Xiaomi nailed it with the Mi A1 with Stock Android (with future OS updates) and a good camera. So, people may have chosen this, over a phone with MIUI (and its slow updates/lack of updates) and an average camera. So, in a way the Mi A1 may have inadvertently, could be the cause of the poor sales of the Mi Max 2 in India. Based on that logic, it comes as no surprise that Xiaomi is giving the Mi Max 2 a price cut. The Mi Max 2 32B variant is now available for Rs. 13,999, while the 64GB model is available for Rs.15,999, after a price cut of Rs. 1000 from the previous prices of Rs. 14,999 and Rs. 16,999 respectively. 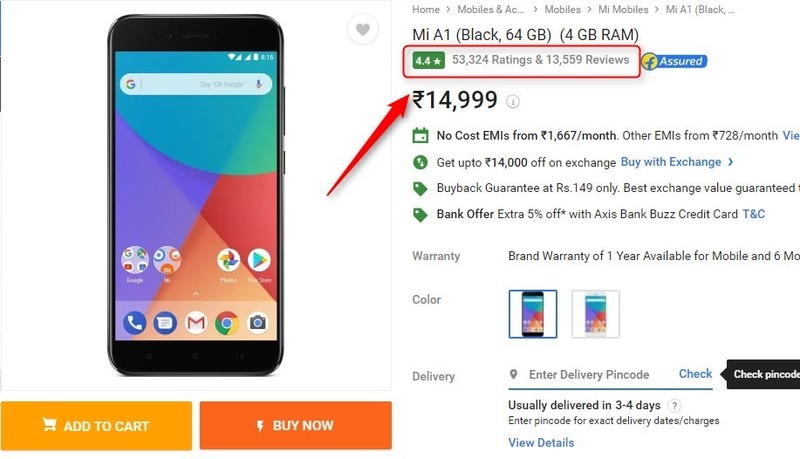 Though it does appear to be a permanent price cut, we are not sure about this, as Flipkart says the offer is valid until stocks last, and the previous price is struck out. Amazon on the other hand lists the phone at its new price, without mentioning a discount. 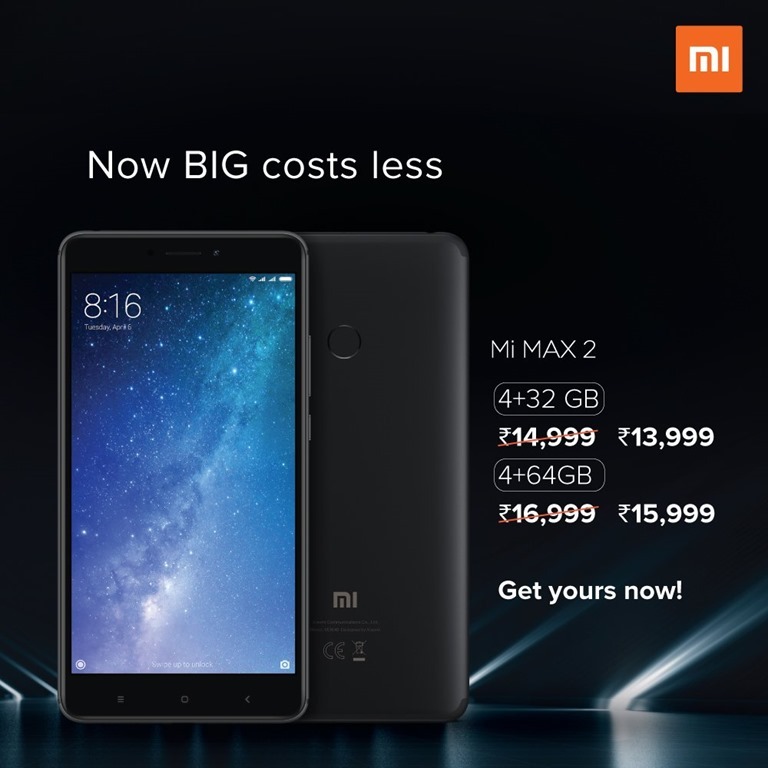 Xiaomi Mi Max 2 price drops by Rs. 1,000 in India.